The parish of Wymondham contains the settlements of Suton, Silfield, Spooner Row and Wattlefield. 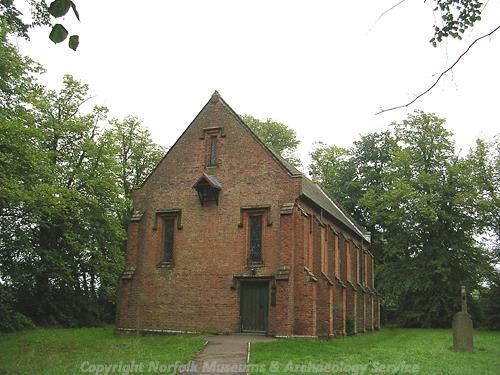 It is situated some 8km to the southwest of Norwich, on the busy A11 road towards London. It includes an area of 4,413 hectares and in 2001 was home to over 12,500 people. There is some evidence for occupation during the very earliest period of human settlement in Norfolk, and this includes three concentrations of pot boilers and burnt flint (NHER 9120, 23112 and 29993) as well as a number of prehistoric pits and ditches from which Neolithic pottery sherds and flint have been recovered (NHER 41125). A very large number of objects from this period have also been recovered. These include polished flint axeheads (NHER 9121, 30891 and 31417), flaked flint axeheads (NHER 9428, 9429 and 9431), scrapers (NHER 11934 and 21589), cores (NHER 22754 and 24018) and a number of prehistoric flakes (NHER 16466, 17922 and 21575). A Neolithic leaf point (NHER 25095) and a Palaeolithic handaxe fragment (NHER 30968) have also been recovered. A number of ring ditches have been recorded (NHER 18314, 31470 and 36404, and these may date to the Bronze Age. Also of possible Bronze Age are a pit (NHER 30872), as well as ring ditches associated with other features such as possible enclosures (NHER 36403) and linear cropmarks (NHER 16657). As with earlier periods, a number of objects dating to the Bronze Age have been recovered. These including a variety of objects such as a barbed and tanged arrowhead (NHER 9430), sword hilt fragment (NHER 28152), socketed axehead (NHER 35845), rapier fragment (NHER 33069), flint flakes (NHER 9432 and 18264), palstaves (NHER 18384 and 29089), chisels (NHER 29286 and 31269), knife and casting waste (NHER 35047) as well as a socketed axehead, spear, chisel and two rapier fragments (NHER 18111) in a single concentration. Also of particular interest are a number of ditches from which Middle Bronze Age pottery sherds have been found (NHER 41125). Occupation here also continued in the Iron Age, with pits, ditches and postholes. Excavation has also revealed a site dominated by the presence of an Iron Age settlement (NHER 25887) which includes pit groups, post holes and evidence of flint and iron working. Objects from the Iron Age period include coins (NHER 25297, 33030 and 34323) as well as harness or furniture fittings (NHER 18111), brooches (NHER 20470) a terret (NHER 20669) pin (NHER 35047), and pottery sherds (NHER 23825, 24588 and 33520). Occupation evidence continues for the Roman period, with an aisled structure on the site of an earlier Iron Age presence (NHER 41125), as well as a copper alloy metal working site on an area rich in multi-period evidence (NHER 18111), where large numbers of coins, brooches and scrap metal fragments have been recovered. A Roman road, running from the Roman town of Venta Icenorum to Watton and beyond, is also visible as cropmarks in this parish. The Roman period has also provided a number of objects including large quantities of coins (NHER 9434, 18586 and 24645), brooches (NHER 9450, 15765, 20470 and 31269), and pottery sherds (NHER 12313, 17922 and 25883). Other finds of interest include a rare example of organic remains such as leather fragments (NHER 8901), as well as collections of personal objects such as mirrors, pins and cosmetic tools (NHER 22710 and 23825), a small Roman duck figurine (NHER 33031) and fragments of cast blue-green window glass (NHER 33069). Objects from the Saxon period have also been recovered and include pottery sherds (NHER 12313, 20669 and 30569), mounts (NHER 29283 and 30887), coins (NHER 33028), horse harness fragments (NHER 33062, 36988 and 37333) and a knife (NHER 33069). A number of brooches have also been recovered, comprising Early Saxon brooches (NHER 18111, 23825, 24644, 25892 and 40472), 6th century cruciform brooch fragments (NHER 25096, NHER 28151), and a 10th century Borre style disc brooch (NHER 28155). It is during this period that the name ‘Wymondham’ develops from the Old English for Wigmund/Wiermund’s homestead. 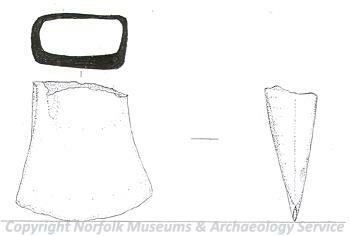 Due to the lack of good quality stone in Norfolk the majority of buildings are timber-framed, and rarely survive, however excavation in 2005 has recorded the presence of a sunken featured building from which Early and Middle Saxon pottery has been recorded (NHER 41125). Excavations in 2002 in Wymondham Abbey also recovered the fabric of what may have been a Late Saxon church on the site of the current nave (NHER 9437). The sedilia in Wymondham Abbey. Courtesy of <?xml:namespace prefix = st1 ns = "urn:schemas-microsoft-com:office:smarttags" />Norfolk County Council Library and Information Service. The current Wymondham ‘abbey’ buildings (NHER 9437) began life in 1107 when a priory was founded by William d’Aubigny, originally as a dependant of the Benedictine monastery at St Albans, until in 1448 it became an abbey in its own right. The current parish church makes use of what was the nave and most of the aisles of the medieval church, as well as the two towers that illustrate the conflict between priory and town during the medieval period. Inside a glorious gilded reredos screen of the 1920s can be seen. The son of William d’Aubigny is thought to have been responsible for the foundation of Beckett’s Chapel (NHER 9439) during the last few decades of the 12th century. The current structure dates to around 1400, when the chapel was rebuilt, and its use as a branch library has allowed the nave to remain undivided and the arch-braced hammerbeam roof to be clearly displayed. During the late medieval period it had been used as a chapel for one of the town’s thriving guilds, though today it and Nos 29 to 31 Damgate Street (NHER 15781) are the only surviving guildhouses. Also constructed by the D’Albinis is a large ring motte known as ‘Moot Hill’, which stands on part of the Stanfield estate and was probably constructed between 1088 and 1139 (NHER 9438). A later medieval moat and manor also stood on the Stanfield estate, although the current Stanfield Hall dates from the late 18th century (NHER 9457). Other estates such as Gonville Hall (NHER 8924) and Burfield Hall (NHER 9128) are also situated on medieval moated sites. The former building dates to the 16th century, and is a fragment of what may have once been a much larger timber-framed building. Downham Lodge site (NHER 13746) is also thought to have been the site of a medieval great house, possibly an abbot’s or bishop’s manor, though the area was abandoned in 1712. Other moated sites survive across the parish (NHER 9943, 9944 and 16212), as well as parks (NHER 9945 and 30466) and other medieval landscape features such as hollow ways (NHER 14295 and 21726) and field boundaries (NHER 29755). It is known that Wymondham was granted a market by John in 1204, and is likely to have benefited from its position close to Norwich on the direct route from the thriving settlement of Thetford. As a result, despite a fire in 1615 a number of medieval buildings survive to this day. Evidence for the fire itself was also noted in 1954, when a cobbled road and burnt timbers were recovered from an area of Market Street (NHER 9448), believed to indicate the passage of the fire here. Of those structures that were less affected by the fire, the Green Dragon Inn (NHER 12033) is perhaps the most picturesque. It is a classic mid-15th century timber-framed two-hall house, with a shop range at the front and the domestic section stretching back from the road. 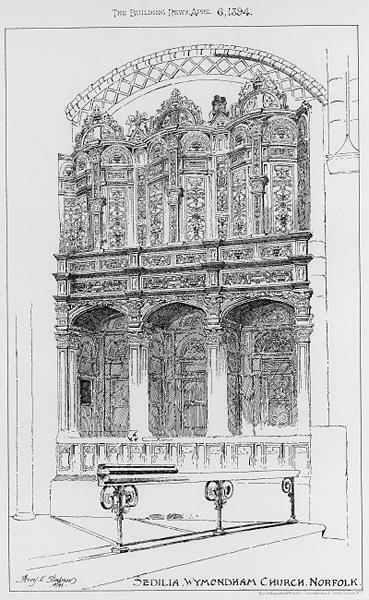 The original plan survives to this day, along with some very intricate detailing. Other surviving buildings include some on Damgate Street such as even Nos 64 to 70 Damgate Street (NHER 13364), originally built in the early 16th century, as well as a number from Market Street. These later include No 12 Market Street (NHER 15776), possible dating as early as 1520, and No 3 Market Street (NHER 15778), which has an early 16th century two-storey jettied hall at the rear. Parts of other buildings, such as Cross Keys Inn (NHER 12035) and No 18 Damgate Street (NHER 15780) are thought to survive from the period before the fire, and other such as the Bridewell (NHER 13361) contain undercrofts or cellars from previous buildings. Although the exact areas affected are not known, we can see the swathe of reconstruction work undertaken across the town centre as a result. The most prominent is the Market Cross (NHER 9446), a timber-framed structure in the centre of the modern town, erected in 1617 to 1618 following the destruction of its predecessor. The building itself is octagonal, with the first floor rooms supported over an open ground floor on timber posts. One of the streets particularly affected by the fire was Bridewell Street. Manor House on Bridewell Street (NHER 12032) is thought to have been rebuilt after the fire, and contains an inscription dating to 1616, as well as one reading ‘my servant is not a dormouse nor is the host a leech’. Odd Nos 11 to 21 Bridewell Street (NHER 15771), have also been dated to 1620 and contain re-used timbers from pre-fire buildings, and No 3 (NHER 15772) was also rebuilt shortly after the fire. Close by, Market Place also suffered from the fire, with a number of properties such as No 8 (NHER 23152), No 15 (NHER 15773), Nos 17 and 18 (NHER 15774), which are all thought to have been rebuilt shortly after the fire. Other buildings of particular interest include Kimberley Hall (NHER 8919), built in 1712 for Sir John Wodeshouse, fourth baronet. It sits on top of the only hill for miles, away from the site of the previous medieval hall (NHER 8918) from which some of the bricks of the later hall were originally derived. Another manorial hall can be seen at Stanfield (NHER 9457), which at present is a Tudor-style building from the late 18th century. In 1848 the Hall was the scene of an infamous double murder, the murderer later caught and hung from Norwich Castle in front of a crowd of 12,000. The settlement of Silfield also has a Hall (NHER 30668), a timber-framed house dating back to the 17th century with later crosswings. Spooner Row church (NHER 9136), built by John Buckler in 1843, is also of interest, sitting as it does on the possible site of Holy Trinity Guildhall. Also of note is Cavick House (NHER 9458), built in 1720 and said to be one of the best houses in the parishes, outside the town. This parish also contains a memorial (NHER 12653) to the first construction of the Attleborough Road, which took place in 1695 and was one of the first three turnpikes to be authorised in Britain and the second to be built, pre-dated only by the Great North Road. From the industrial history of the parish is Silfield Mill (NHER 9456), which was built in 1850 and ceased working in 1911 and has now been converted to a private residence. The sites of a number of post medieval brickworks have also been noted (NHER 9459, 9460 and 15949), a saw pit (NHER 14381), post mill (NHER 15301), North mill (NHER 15784), Northfield Mill (NHER 18027), as well as the site of Rattle Row (NHER 12341), a row of Weaver’s cottages built between 1810 and 1820 and demolished in 1977. 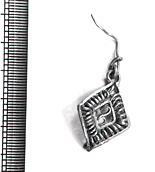 Objects from the medieval and post medieval periods have also been recovered. Of particular interest is a late medieval coin hoard that was recovered around 1881 (NHER 9441) and contained some 300 English and Irish silver groats, thought to have been deposited around 1485. Also of interest is a gilt copper crozier (NHER 14197), and a medieval gold signet ring depicting a lion rampant (NHER 14548). Although the later two objects come from unspecified locations, more is known about a medieval gold ‘collar’ (NHER 15765), with repousse decoration and set with turquoises. Finds from the post medieval period are less common, but include a silver dress hook (NHER 36823), and a gilded silver hook tag (NHER 36228), as well as many coins (NHER 9431, 31303 and 33081). There is also evidence of World War Two period monuments in this parish, and this includes two aircraft crash sites (NHER 30872 and 33779), as well as a small number of pillboxes (NHER 20936, 32486 and 32714), and a spigot mortar gun emplacement (NHER 32485). Perhaps the most recent archaeological record is the Cold War monitoring post (NHER 35436), which was one of 55 in Norfolk in use to monitor potential fall out during a nuclear war. This site was closed down in 1991, but the entrance hatch and Orlit post nearby are still intact. http://en.wikipedia.org/wiki/Wymondham. Accessed 14 May 2007.